Killamarsh Secondary Modern School Football Team. See note below. Photo courtesy of Janet Jackson (nee Gascoigne). hello to anybody who knows me. all the people on this photo are all older than me. i am now 71. anybody know if they are still with us? if so where are they? i know roy batty is still around as i spoke to jean at brian wallers funeral. any body else? mick weston. Back row: Teacher, Roy Batty, Roy Jackson, ? ?, Henry Upton, Brian Fleet, Les Hutchinson, Geoff Jackson. Front row: Derek Plant, Norman Jackson, ??, ? ?, Geoff Pattison. Seated on floor: David Plant. Can anyone give the year and fill in the gaps in names? Is it John Oliver? at the side of Norman Jackson. 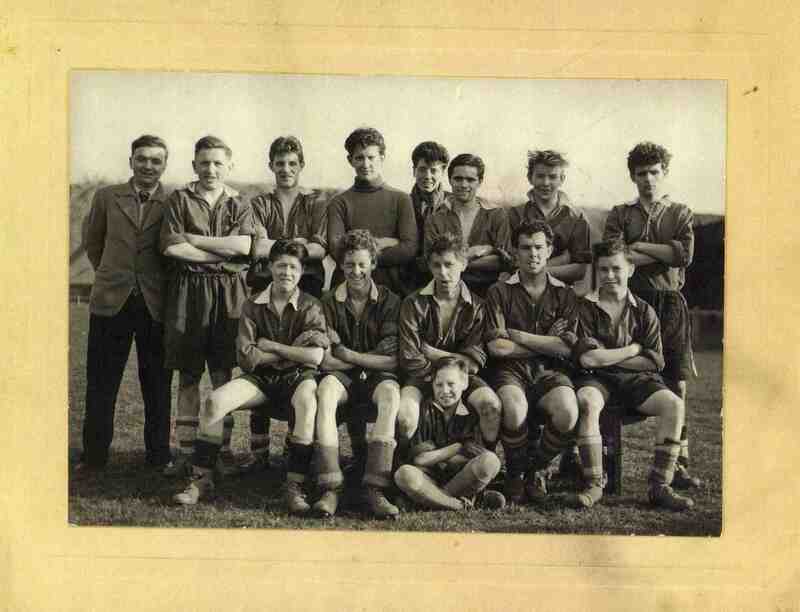 The goal keeper in polo neck back middle is my dad, John Draper.